When you think of Garagiste wineries, I would suppose that many would think of small wineries like Four Gates Winery, or the Weiss Brothers, and/or Jonathan Hajdu. 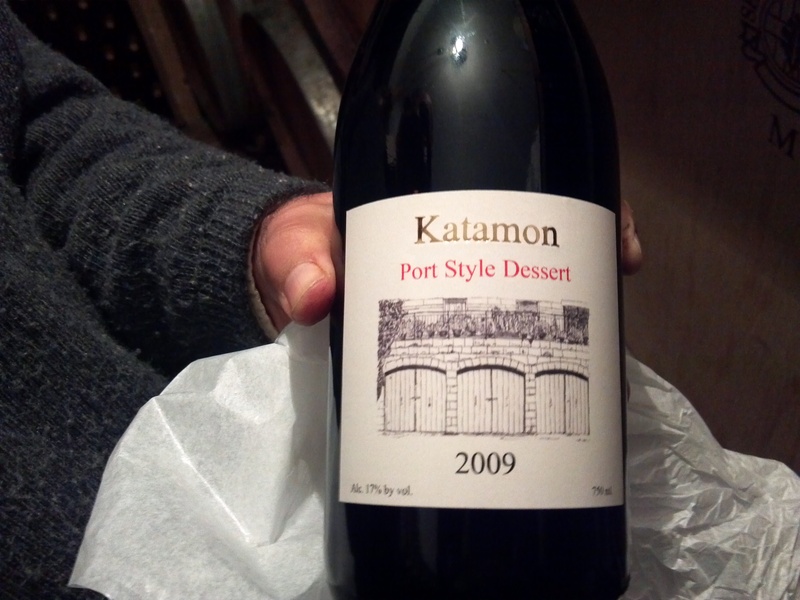 Actually, the smallest winery I have visited recently, is the Katamon Winery. The winery gets its name from the fact that the winery is actually IN Katamon – an historic neighborhood in south-central Jerusalem. 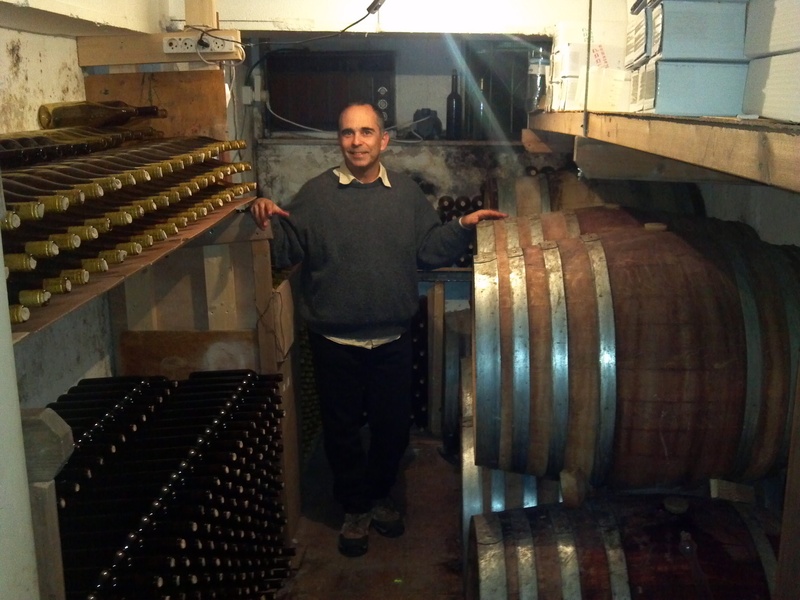 The wine maker Avital Goldner, started his winery in 2002 with some 300 or so bottles. Since then, he has grown the garagiste winery to some 1,800 or so bottles a year. This is my 11th article on the wineries in the Judean Hills, and the Katamon winery may well be in the heart of the Judean Hills. The winery can be found in Jerusalem city proper, and may well be the only winery in the city limits proper. The Jerusalem Winery (newly opened), does exist, but it is on the outskirts of the Jerusalem in the industrial zone. I called Avital and he was very kind to allow me to come and visit his winery. I got off the bus that took me to a park across the street from his home. 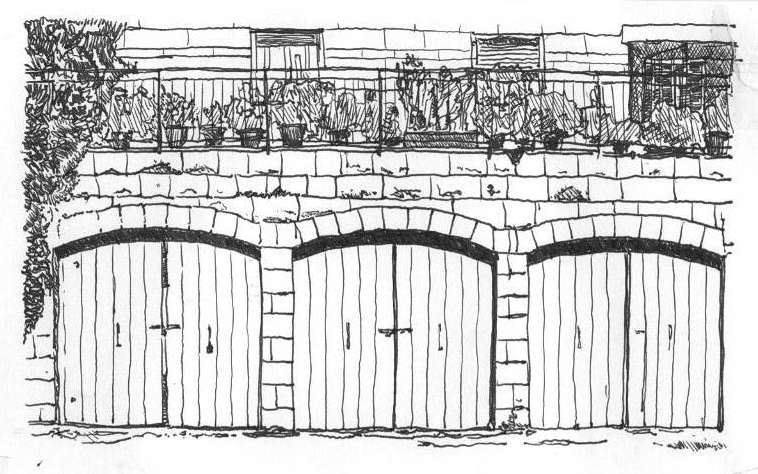 I walked through/by the park and knocked on his garage door. Avital was there varnishing something for his daughter’s wedding – if I remember correctly. He grabbed some glasses and I followed him down into his machsan (storeroom/basement) which he has turned into his barrel and wine storage room. 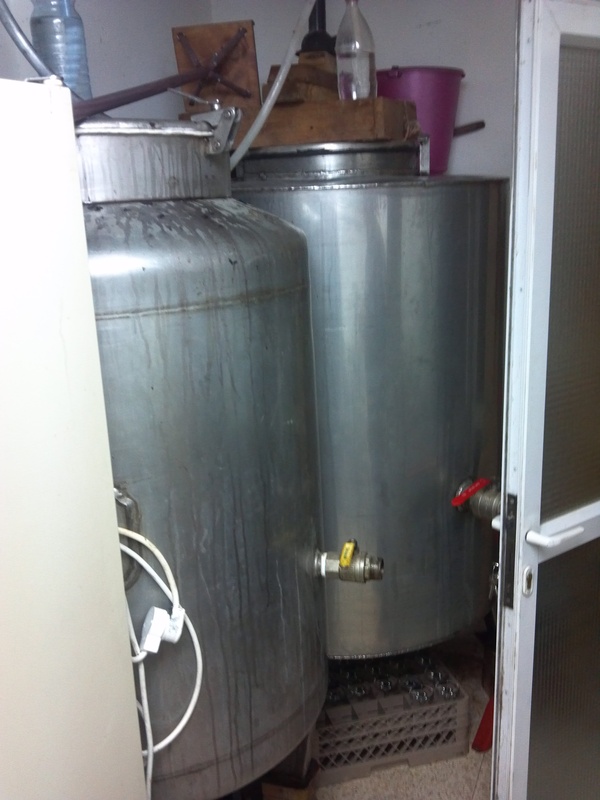 As we walked down to the storeroom, Avital showed us the steel tanks, in which he does his wine fermentation. As he opened his machsan, you could see the barrels and bottled wine aging in a humidified bliss. He laid out the machsan in a very ingenious manner to maximize every available square inch of the room. The barrels are stacked upon each other (using a barrel stand) and on top of that and to the left are bottles neatly stacked upon each other aging away until it is their time to meet their buyer. As we were talking I was surprised to learn how Avital got into the business. He said that he wanted to try his hand at making wine and he found a willing wine-expert to help him along his way. 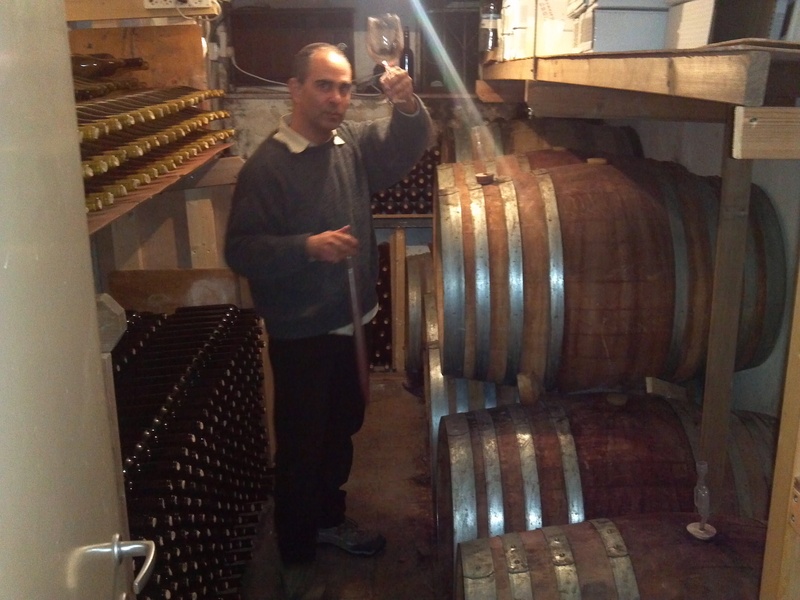 That expert would be none other than Eli Ben Zaken, the head winemaker at Domaine du Castel Winery. The more Avital spoke the more impressed I was with Mr. Zaken, clearly Avital had learned his craft, but as he spoke about his conversations with Mr. Zaken, explaining that they were sometimes frequent and complicated, it became clear that these were not casual two-minute conversations. Avital is a sofer, a Jewish scribe who writes Jewish texts in Hebrew for religious purposes. When I met him in his garage, which can be seen on the winery’s logo – a picture of three garage doors, (one of which is his), he was working on a mezuzah, if I remember correctly. The life of a sofer is lonely and slow, but very flexible, which gives one ample time to work on the wine business. Avital started his love affair with wine, in 2000, when he made a wine using Muscat grapes in a bunch of small containers. From there, Avital went on to buy his grapes from Gush E’tzion in 2002, the winery’s first year. The process of self-learning continues and eventually the experience one has found from years in the trenches takes over. Sure school is great for the theory and the basics, but after a point it is all about the experiences you have in your craft that you tend to lean on more and more. Currently, all the grapes used in Avital’s wines are sourced from around another wonderful winery that we love greatly, the Karmei Yosef Winery. After a bit we started to taste through the barrels and it was quite clear that the wines were not superstars, but they were also not what I had come to expect when hearing about the winery from others. I guess the lack of marketing does stop some from trying the wines, but I found many of them to be solid and some to be very good. Also, it is clear that the experience that Avital has honed in this craft, is starting to take hold and he is producing very good wines, that I would happily serve on my shabbos table, as I did two weeks ago. Personally, the new Cabernet Franc is a clear sign of the winery’s evolution and its growing wine portfolio. Unfortunately, the Cabernet Franc will not be sold as a single varietal, rather it will be blended into Merlot for a 2010 blend, that should be available next year. All wines can be purchased at Avital’s home, much like the way my friend Benyamin, from Four Gates Winery sells his wine. It may not be as convenient as strolling down to your local wine shop and getting some wine. But remember, that Katamon Winery, exists in a very easy to get to location! The current wines available are the 2009 Chardonnay, the 2009 red wine blend, the 2009 port like wine, and a 2010 Johannisberg Riesling. The nose strikes quickly with a rich perfume of chocolate, raspberry, dirt, and ripe plum. The mouth is layered with light hints of date, lovely cedar box notes, and mouth coating tannin that make the entire mouth sing. The finish is long with nice chocolate, tobacco, a hint of leather, and some nice violet at the end. The wine is a classic Bordeaux blend of 50% Cabernet Sauvignon and 50% Merlot. The nose starts off with blackberry, plum, followed by graphite, and crushed herbs. The mouth is rich with layers of fruit that are balanced nicely with mouth coating tannin and expressive cedar. The finish is long with good chocolate, vanilla, tobacco, and nice black olives. This was tasted from the barrel, but the bottles are from a different barrel. This is a wine that is a blend of Cabernet Franc and Merlot and was aged in barrel for 18 months. The nose starts off with ripe blackberry, candied cherry, bramble, alcohol, and nice sweetness. The mouth is rich and sweet with mouth coating tannin that is accentuated by the brandy, candied fruit, blackcurrant, and lovely cedar. The finish is long and mouth filling with a hint of tobacco, chocolate, vanilla, plum, and sweet cedar. This is a nicely balanced port style wine that is more than capable of handling your toughest desert. The wine comes from the Judean Hills and is a grape that was very prevalent in the vineyards around Jerusalem, before vineyard owners ripped them up in favor of the more noble grapes. However, if you can still find some of these old vines that are pumping out lower and more concentrated yields – get them! The nose on this yellow gold-colored wine starts with rich honey, violet flowers, oily goodness, along with a rich perfume of grapefruit and peach. The mouth is equally perfumed and well-balanced with fig, bright citrus lemon, and mouth coating sweetness that goes on forever. The finish is sweet with almond notes, vanilla, and a hint of oak. The wine is a true pleasure and one worth enjoying with a cream Napoleon or a chocolate mousse. To start do not let this bottle fool you, the brownish hue you see when holding the actual sealed bottle in your hand does not mean it is DOA. Rather, the Chardonnay is bottled in a darkish brown bottle! The wine is very reminiscent of Castel ‘C’ Chardonnay, which should be of ZERO surprise, as Avital said that he asks Eli Ben Zaken (the wine maker of Castel) many questions, and Eli is very gracious with his time. The nose on this wine starts off with screaming oak, butterscotch, and caramel all extracted from the 12 months of barrel aging in both American and French barrels. The nose continues with hints of melon and pineapple. Overtime, the nose opens to more classical tropical fruits and fewer butter notes. The mouth on this medium bodied wine is rich with clear oak influence, but explodes with lovely ripe and bright fruit, including pear, lemon, peach, apple, and lovely toasted brioche. The finish is long and toasty with earthy elements, fig, lemon zest, and a hint of violet at the very end. This is a lovely bottle that has about another year, but why wait – drink now and enjoy! 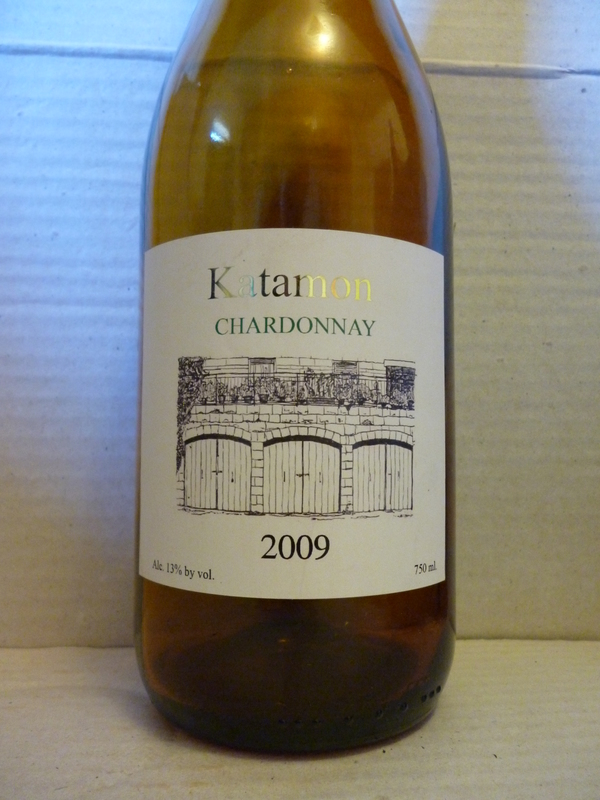 Posted on June 11, 2012, in Israel, Israeli Wine, Kosher Red Wine, Kosher Semi Sweet Wine, Kosher White Wine, Kosher Wine, Wine, Wine Tasting, Winery Visit and tagged Chardonnay, Katamon Winery. Bookmark the permalink. 1 Comment.